Sportswear has become more and more popular recently. Sportswear became not only the norm of the gym, but also the high fashion choice for everyone. And that’s logical because today’s fashion industry is driven by a combination of comfort and functionality. So, it’s all about activewear pieces that help create stylish, sporty looks and meet the daily demands of everyone. When it comes to the word combination “high fashion”, we just imagine some elegant and luxurious clothes made by well-known fashion designers. How could it happen that sporty outfits became a part of a high fashion? Of course, it was a long and circuitous process, which began in the 1920’s in France and simultaneously in America. Thanks to social change, urban adaptation and development of synthetic fibers, now sportswear brands are extremely popular throughout the world. How did sportswear fashion become high fashion? Sportswear era started in the 1920’s when two Parisian tennis players – Jane Regny and Suzanne Lenglen – decided to include their sporty clothing in the collegiate style. At the same time, activewear became of great demand among American women because they found such clothes comfy and cute to watch spectator sports. The development of stretch materials increased the production of nylon athletic shorts, anoraks and zip-up hoodie windbreakers. In the 1960’s color-coordinated nylon and cotton tracksuits were available on the fashion market. Besides, gray, red and blue ones are considered classic sportswear now. However, not only tracksuits were popular in the 20th century. After World War II people focused on ski suits. Before the war, ski suits were the outfits for a pastime of the elite, but after the war when activewear designers created zip pockets, concealed hoods and stirrup straps people appreciated all the advantages of ski suits. In the 1970’s, sneaker style was adopted by most fashionistas. The sneakers raised hip hop fashion to a new level of influence that actually remains powerful today. At that time, yoga pants stopped being outfits just for yoga class and were included in the street style. So, the sportswear style became high fashion thanks to its simplicity and multi-functionality. Tracksuits, yoga pants, sneakers and ski suits could kick-start the process that is going from strength to strength. 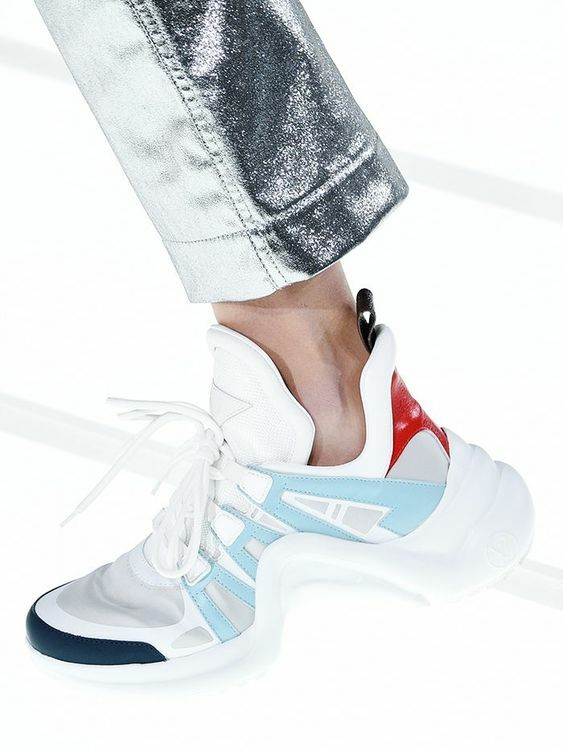 What are the top athletic high fashion trends of 2019? If you’re looking for the ways to refresh your spring look and you’re a fan of activewear, you should know the biggest sportswear trends of 2019. A sport dress is a wonderful outfit for ladies who prefer to go from the gym to the street in order to lunch with friends or go shopping. Cool sport dresses ensure maximum comfort and make you look stylish and elegant wherever you go. For spring/summer ’19 striped sporty outfits are the top trend. If you choose striped tracksuit, sweatshirt or generally any striped sporty piece, you’ll look nice and fashionable. It may seem a bit nostalgic to wear chops, especially with leggings, but we all agree that chops never go out of fashion! Sneakers are one of the most favorite shoes for most busy people. This year it would be better to focus on space-age designs if you want to be in style and stand out from the crowd. Now you can think about your new sporty look…That’s really great that comfort and functionality can be combined and make you look chic. Nancy Cooper is an editor of thecrossfitshoes.com. She helps people get stronger. She shares running and sports questions, beauty tips. All her stories are result-oriented and make her readers become healthy, wealthy and wise.